Passengers check in for flights with United Airlines at Chicago O'Hare International Airport. United, American and Delta now offer no-frills "basic economy" fares. 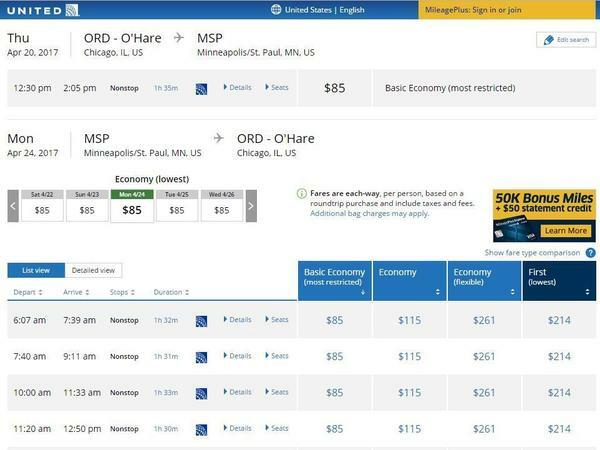 The United Airlines website displays the new "basic economy" fares for flights from Chicago to Minneapolis-St. Paul. The big three U.S. airlines — American, Delta and United — are all taking on the discount carriers by offering no-frills, discounted fares, called "basic economy." Some critics call it "misery class" because you'll board last, sit in a middle seat near the back of the plane, and on United and American, you can't bring a carry-on bag. Now there is evidence that this lower class of fare is not any lower priced, but instead is a way to raise standard economy fares. 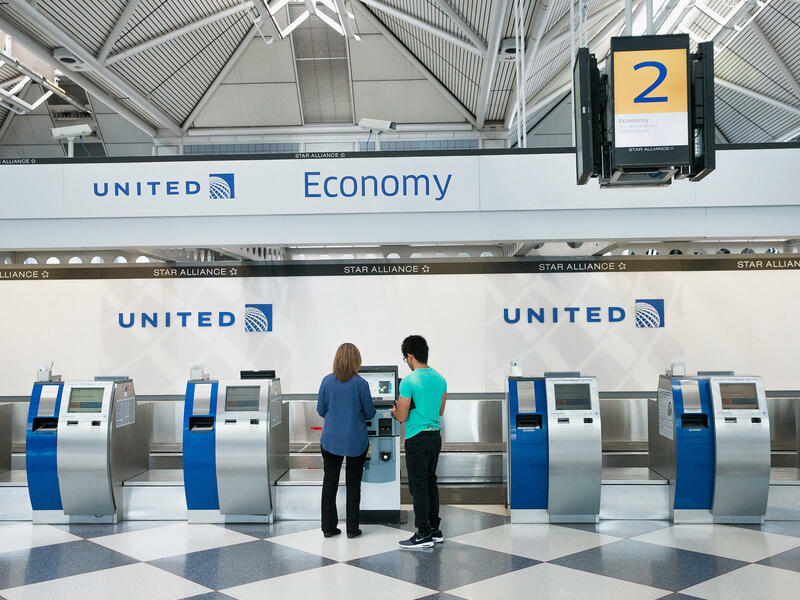 In launching the new "basic economy" fare class, which will be available for travel starting on April 18, United Airlines calls it "a lower-fare option," which begs the question: lower than what? It's certainly not lower than current fares. A check of fares on United's website on the seven initial routes on which the airline is offering basic economy shows the lowest basic economy fares are the same as the lowest standard economy fares before April 18. So you're essentially getting a lower class of service for the same price as now, but choosing your seat and putting a carry-on in the overhead bin, as you do now for free, will cost you $15, $20 even $30 more. The same appears to be true on most of American's and Delta's basic economy routes, too. So what gives? Is this a bait and switch? "To be 100 percent clear, the airlines are not offering lower fares than they were offering before basic economy was introduced," says Gary Leff, who writes the View from the Wing travel blog. He says the airlines may have initially offered basic economy to compete with the growing ultra-low cost carries such as Spirit and Frontier. "They decided that they wanted to give you less — something approximating what those low-cost carriers were providing at that price point — in hopes that you would pay more to get the kinds of services that you were used to from those airlines," Leff says. He says the big three airlines are banking on convincing travelers to pay more for services that seem kind of basic: choosing your seat, making sure your family is seated together, and putting a carry-on bag in the overhead bin. "It's a strategy to raise the revenue that they're earning off of every seat," he says. The airlines deny they've been misleading, as none actually said basic economy would be cheaper than current fares. United calling it a "lower-fare option" apparently means when compared to other fares on that same flight. American more carefully describes basic economy and its restrictions as "a new set of attributes" for the airline's lowest fare, while Delta defines it as "lower cost" with fewer amenities than the main cabin experience. All three companies point out they still offer a free beverage and snack, which the discount airlines do not, and they have much wider networks of destinations. Regardless, basic economy does create yet another consideration in an already murky sea of options when booking air travel. "Yeah, it's getting a lot more confusing because of that," says Jeff Klee, founder and CEO of the travel search website CheapAir.com. "It'll be much more of a challenge to shop for air fares and it'll be important to make sure you're comparing apples to apples." Klee says now that more airlines have multiple price points for each flight, consumers can't just focus on the lowest price but need to know exactly what they're getting for that price. But don't expect Southwest Airlines to climb on the basic economy bandwagon any time soon. CEO Gary Kelly told investors on a conference call recently the airline will still differentiate itself by treating all its customers the same — no checked-bag fees, no change fees and no second class. The big three airlines - American, Delta and United - are taking on discount carriers like Spirit and Frontier by offering no-frills discounted fares called basic economy. Some are calling it misery class because among other things, you will board last, sit in a middle seat near the back of the plane. And wait, it gets worse. As NPR's David Schaper reports, there's evidence this lower class of fare is not actually always priced lower. DAVID SCHAPER, BYLINE: At United, the new basic economy fare class will be available on April 18. The airline calls it a lower fare option. Which begs the question, lower than what? I'm checking fares on United's website on the seven initial routes that United is offering basic economy. And it shows that the lowest basic economy fares are the same as the lowest standard economy fares before April 18. For example, from Chicago to Minneapolis before the 18, standard economy - $85 each way. After the 18, basic economy is 85 bucks while standard economy is now $15 more. So does that mean that you're essentially getting a lower class of service for the same prices now only with more restrictions? It sure appears so. And the same seems to be true on most of American's and Delta's basic economy routes, too. So what gives? GARY LEFF: To be 100 percent clear, the airlines are not offering lower fares than they were offering before basic economy was introduced. LEFF: They decided that they wanted to give you less, something approximating what those low cost carriers were providing at that price point in hopes that you would pay more to get the kinds of services that you were used to from those airlines. SCHAPER: So that means services that seem kind of basic like choosing your own seat, making sure your family is seated together and putting a carry-on in the overhead bin, Leff says the big three airlines think travelers will now pay more for that. LEFF: It's a strategy to raise the revenue that they're earning off of every seat. SCHAPER: The airlines deny they're being misleading. United's lower fare option appears to mean when compared to other fares on that same flight. American more carefully describes basic economy and its restrictions as a new set of attributes for the airline's lowest fare, while Delta describes it as lower cost with fewer amenities than the main cabin experience. All three point out that they still offer a free beverage and snack, which most discount airlines do not. And they fly to many more destinations. So basic economy becomes yet another choice in an already murky sea of options when booking air travel. JEFF KLEE: Yeah. It's getting a lot more confusing because of that. SCHAPER: Jeff Klee is founder and CEO of the travel search website cheapair.com. KLEE: It'll be much more of a challenge to shop for air fares. And you'll - it'll be important to make sure you're comparing apples to apples. SCHAPER: Klee says now that more airlines have multiple price points for each flight, consumers can't just focus on the lowest fare. They need to dig deeper and find out exactly what they're getting, and in many cases not getting, at that price. David Schaper, NPR News, Chicago. (SOUNDBITE OF VIVID LOW SKY'S "LOW FLYING PLANES") Transcript provided by NPR, Copyright NPR.